The concept of birthstones has its roots in Biblical history: in Exodus, Aaron’s sacred breastplate was encrusted with 12 gemstones to denote the 12 tribes of Israel. As astrological study became more popular, gemstones were paired with a designated sign of the Zodiac. It wasn’t until the early 20th century, however, that the idea of attributing a gem to a birth month became a big tradition. Today, birthstones are set within jewelry as an outward expression of our personal story and individual link to the universe. 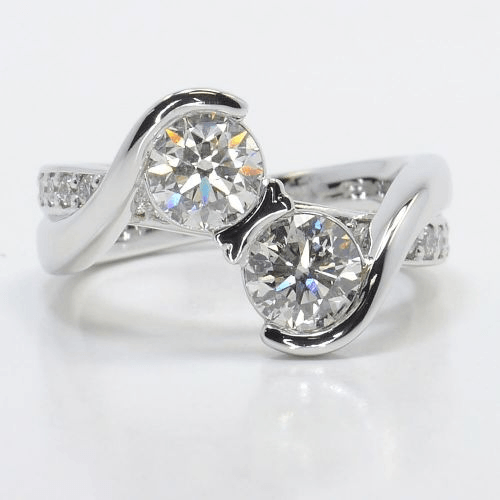 When set in an engagement ring, they can symbolize your depth of feeling and connection to your soon-to-be spouse. Derived from the Latin word for “seed,” the garnet’s color resembles pomegranate seeds and beautifully accents a center diamond as larger side stones. Alternatively, inset tiny garnets within a band for a glittering red spark. Protect the garnet with a sturdy setting, like a bezel or basket style, as this gemstone isn’t as durable as others. Lavender-hued Amethyst is an increasingly popular choice for engagement ring solitaires and accents. The purple tone looks vibrant against a silver toned metal and also pairs well with yellow gold for a more regal presentation. 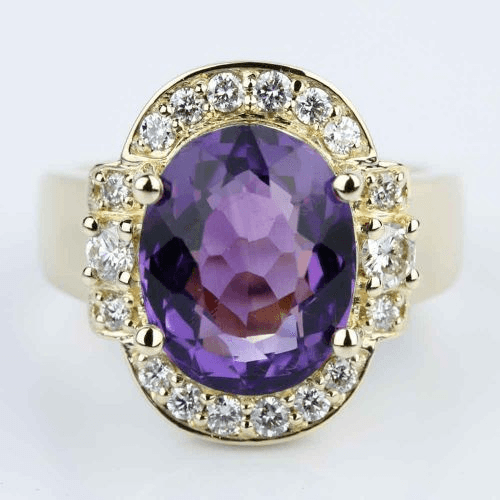 Amethyst rings are budget-friendly for those who prefer heftier carat weights, so don’t be afraid to look for a big stone if you opt for this purple fashion favorite. Named for its watery shades of light blue, Aquamarine adds understated calm to a ring. This stone is striking as either a smaller accent or as a solitaire. Aquamarine stones can also be used as a pave setting for a subtle sparkle along a white-gold band. 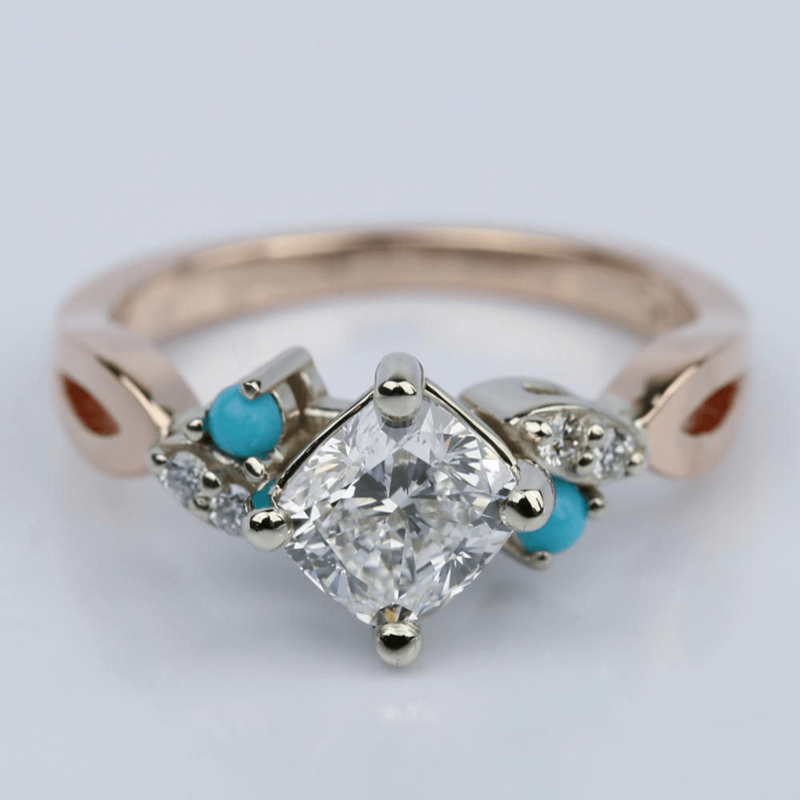 Be aware that smaller stones show less color, so you may want to avoid using aquamarines in a micropave setting. April’s gemstone is the hardest gemstone on Earth and is the signature stone in almost every engagement ring. Just because April’s stone is the diamond, that doesn’t mean you have to give up on color. Don’t be afraid to dress it up by pairing it with a beloved’s birthstone for a customized dual stone ring like the one inspired by Jackie Bouvier Kennedy’s engagement ring from JFK. Glowing gorgeous green, the emerald is adopted into many engagement ring settings for its signature beauty. Emeralds are stunningly bold side stones, and look lovely when lined within a band for a pave setting, as a halo or just as small accents. There is no wrong way to rock an emerald. Go for a unique look and choose one of this month’s birthstones as the focus of the engagement ring. Pearl solitaire rings have antique appeal while milky moonstone conjures magical mystique for an enchanting ring. Alexandrite offers more versatility with colors ranging from a deep indigo to a startling green hue, with some stones exhibiting color changing properties. 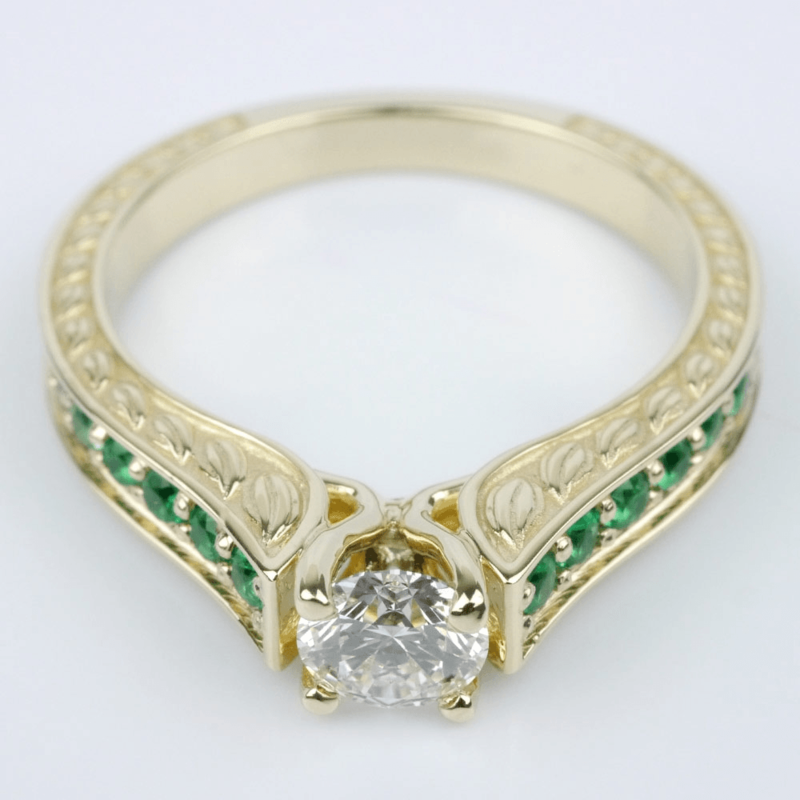 A more traditional gem, this stone works well in any setting style. The Ruby is quite the ring chameleon. 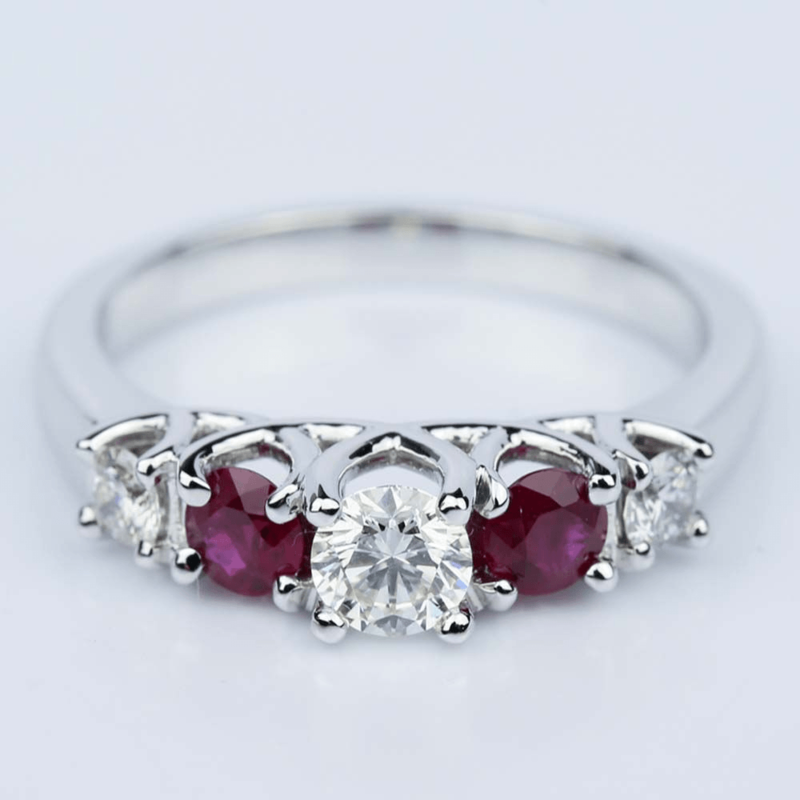 Whether the gemstone is used as a large accent, in a halo, a small accent or as the center stone, ruby wraps the ring in regality. Play and paint with the beautiful velvety red color to create a dream ring for your July-born sweetheart. The vibrant lime green hue is beautifully bold. Keep the Peridot’s cool coloring in context by setting it within a lighter toned metal. Use the stone to create dainty leaves within antique patterns or nudge it near a diamond as an intriguing side stone. The affordable and often underrated stone is great for bold, unusual designs. 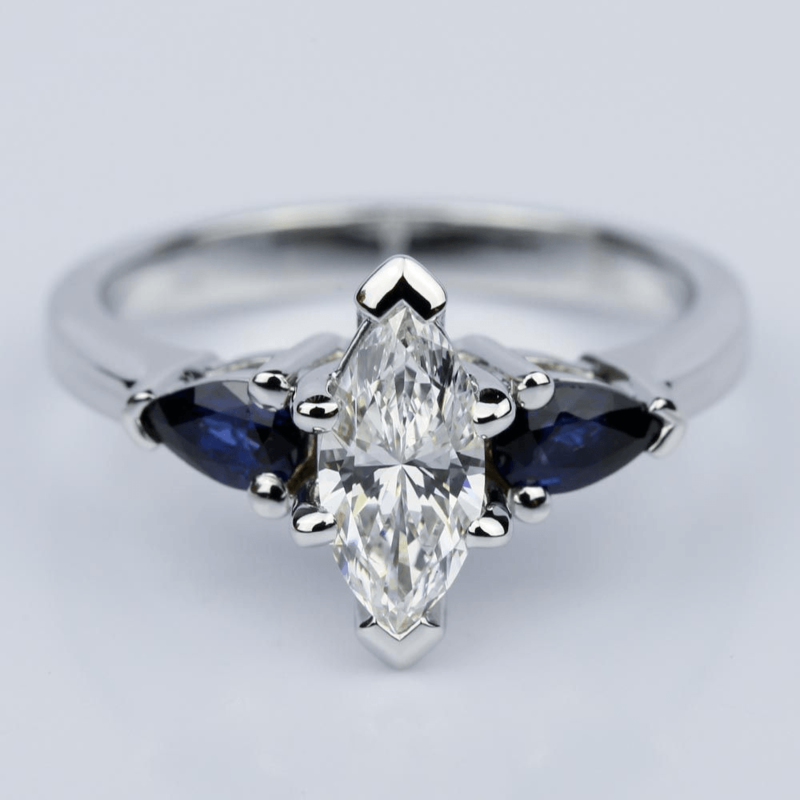 Regal blue sapphire is one of the hardest gemstones. This durability is ideal for a center stone. 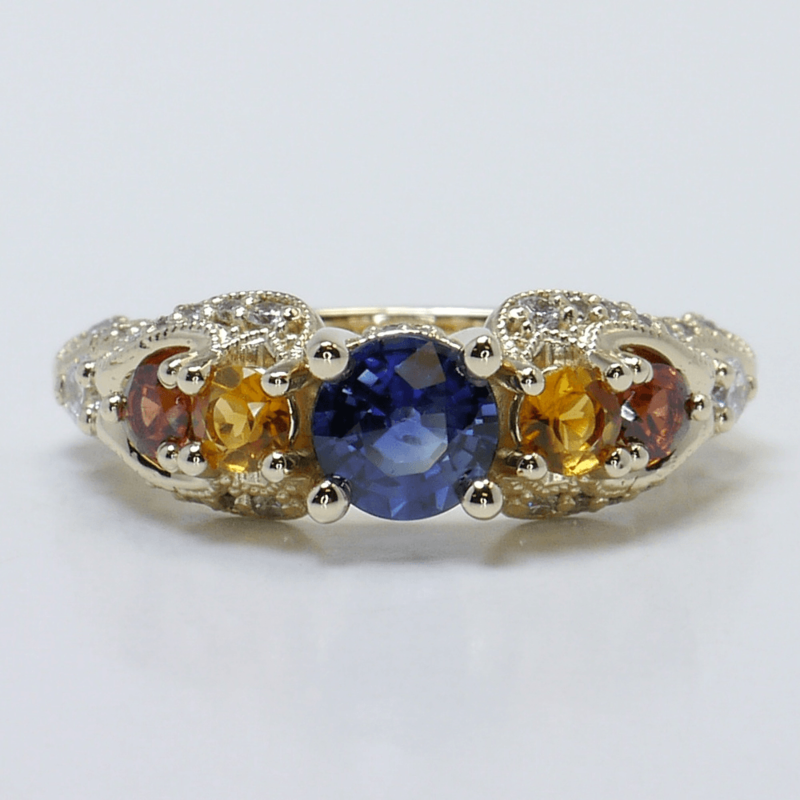 Sapphires are probably the second most common stones used in jewelry, and are actually found in a rainbow of colors. Use blue sapphires to draw dark halos around diamonds, as magnificent side stones or as pave accents along the band. Pink sapphires are great for larger and smaller accents and are perfectly paired with heart-shaped diamonds. Yellow, white, orange, and black sapphires are also found in nature, and jewelry, with varying degrees of rarity. Fire dances within the opal. Small opals provide a dainty accent, but larger stones capture the stunning iridescence best. 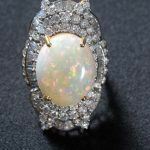 For contemporary beauty, set an opal in a bezel setting. For vintage appeal, frame it within a Victorian-inspired Buttercup prong setting. Change up the look by choosing between black opals, fire opals, and Australian opals, all with their own hues and iridescent flashes. Opals are fragile stones that require special care in order to last a lifetime, so be sure to educate yourself about the stone before committing to an opal purchase. 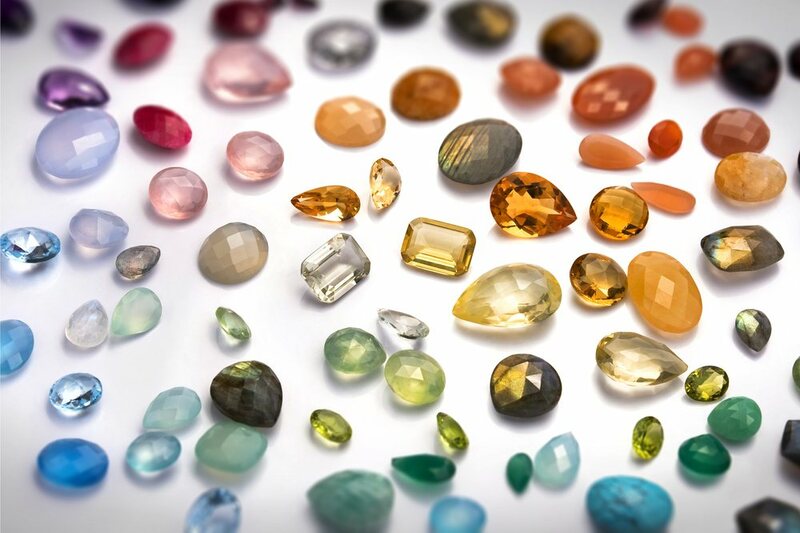 For a more traditional gem type stone, opt for tourmaline, which also exists in a variety of colors and works well as a center stone or as smaller accents. The green, pink, and blue shades of this gem are vivid and deep, making for stunning color. Named for the citrus fruit, the citrine is lusciously yellow in hue and bursts with happiness. Citrines may be used as solitaires and look similar to a fancy yellow diamond. You can also use them as accent stones in more unique, custom settings. Additionally, these affordable stones will allow you to go big without breaking the bank. Topaz is a versatile and very affordable stone, also found in a rich, yellow tone but more commonly seen in blue hues, like the Swiss blue and London blue. Considered a semi-precious stone, like citrine, topaz lets you opt for size at low cost. More like an opal, pearl, or moonstone, turquoise isn’t actually a gem quality stone, but its unique color and history make it both beautiful and interesting. Choose turquoise cabochons to accent a center diamond and add artisan detail. Dainty stones draw the eye to the ring, and the calming tone pops against any metal tone. Zircon has a light to vivid blue hue and should not be confused with the diamond alternative cubic zirconia. The gemstone can easily stand alone as a solitaire with its calming vibrant blue hue. 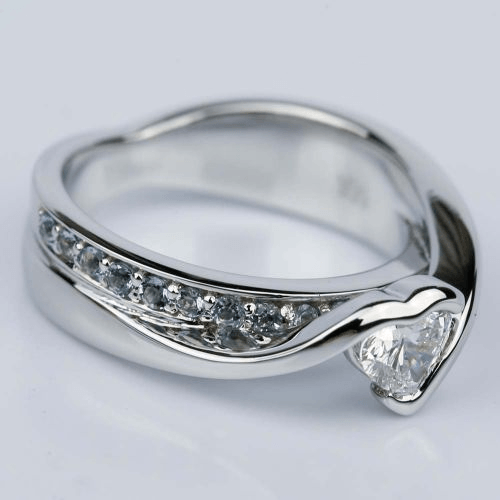 Or add a pave set line of alternating diamonds and zircon to accent the band around a center diamond. 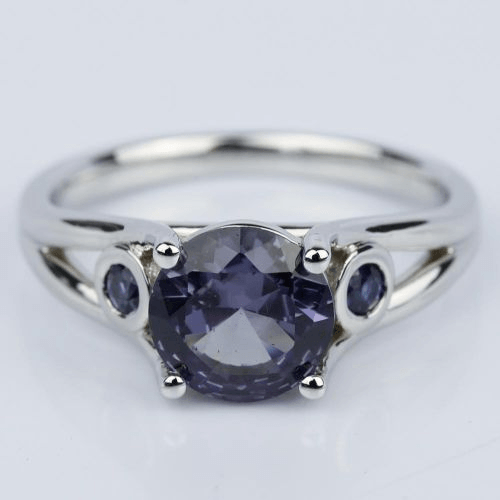 Tanzanite has a light purple-blue color that stands out in comparison to other gemstones. 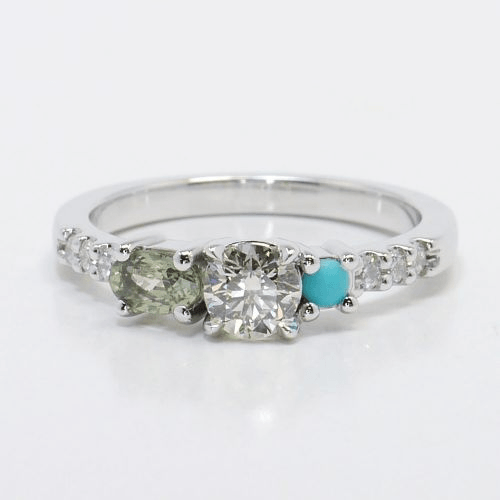 A beautiful and unique gemstone, it is often favored as a center stone or as larger accents in a three stone ring design. It is probably the most commonly used December birthstone in fine jewelry, but is also surprisingly affordable. Each birthstone holds a unique beauty and meaning. 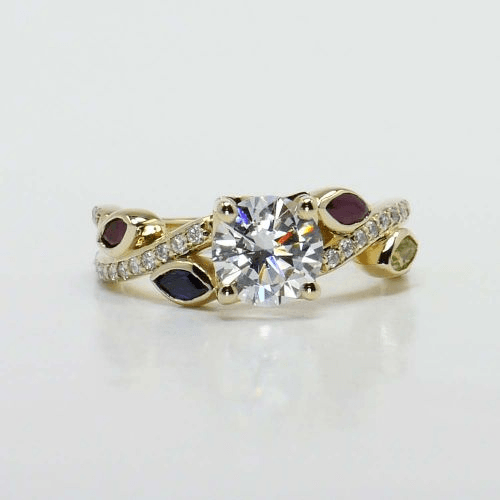 When used in an engagement ring, this results in beautiful pops of color with a symbolic twist. By creating a custom engagement ring with birthstones, you’ll have a one-of-a-kind piece of jewelry that holds a personal and endearing touch of Brilliance.